Summertime is so hot and cooking in the kitchen can make it even hotter. These air fryers are perfect because they keep the heat inside of the fryer, which helps to cool down your kitchen. Air fryers can make all kinds of food including delicious breakfasts, veggies, sides, main dishes and even desserts. Enjoy healthy and delicious food at the touch of a button! Brought to you by Todd English, this touchscreen digital air fryer features an ultra compact design with rapid air cooking for frying foods. This air fryer circulates hot air to cook food perfectly without a whole lot of oil - just a spoonful and you get the same results as deep-fried food. Its seven cooking modes are perfect for all your food cravings: fries, bacon, shell fish, bake, poultry, meat and fish. You get perfectly cooked dishes within minutes. Your kitchen doesn't need to smell like fish. This air fryer features a removable carbon filter to reduce odors in the kitchen. Use your air fryer to make a special main course or side dish to liven up your family dinner. The extra large fry basket is perfect for large family gatherings, while the sleek and space saving design fits beautifully in any kitchen decor. Plus, it doesn't take up a lot of room in limited counter or cabinet spaces! First, They are not in Phoenix, Arizona. Never have been (they're in Boston). Their name refers to the mythical bird, the Phoenix, which is reborn to soar again. Their home goods, plus size clothing, kitchen appliances, and other products are sort of like that. They buy large volumes of out-of-season, overstock and clearance designer merchandise from national retailers and TV shopping channels, then pass the savings to you - on average offering the goods at 60% below retail. And by the way, the pictures of shoes and clothing you see on their site are the actual items that you’ll get in the mail. 1. Rinse the cauliflower after cutting under running water. 2. Coat with egg and then with flour. Repeat. 3. Place the cauliflower pieces on fryer shelf. Do not overcrowd. 4. Bake at 400 degrees in a single layer for 10 minutes. Remove the basket and toss. 5. Return the fries to the oven for another 5 minutes at 400 degrees. The above recipes is mine, but there are a bunch of other great recipes in “In the Kitchen” cookbook. 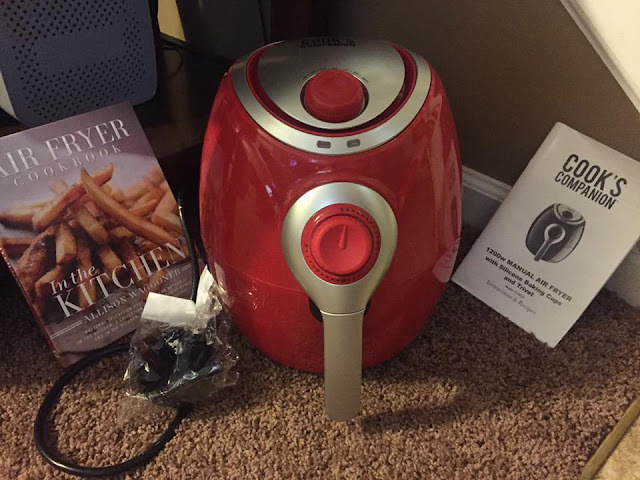 Enter below to win this great air fryer prize pack. I received complimentary products to provide this post. All opinions are my own. Nanny to Mommy is not running this giveaway or in charge of prize fulfillment.